Transgender-conversion organization Reality Resources, made its first official announcement of closure this month. According to their website, Jerry Leach, the founder and sole counselor said he was retiring; the website was removed soon afterward. Jerry and his assisting wife, Charlene, were active from their mid forties to mid sixties. Reality Resources was one of very few places "converting" transgender people. Others include the secular CAMH, who only deals with children, and possibly Warren Throckmorton. Reality Resources was the only agency to use reparative therapy. In 1988, after decades of hating his maleness and privately cross dressing, Jerry began attempting to change his body behind Charlene's back. When faced with the dilemma of keeping his male role versus losing Charlene, his children, and his pastoral ministry, Jerry chose his family and job. Like Michael Bussee, Jerry instantly became the expert on "change" for transgenderism; within months he joined an Exodus member was counseling, eventually becoming an Exodus regional director. Jerry had a "falling out" with Exodus and lost his membership though everyone is tight lipped with the public. At the same time, Exodus changed its mission and no longer include transgender issues. Apart from occasional Christian interviews, Jerry stayed low key. He avoided politics or even persuading trans people to join him. He only counseled highly motivated people. The vast majority of his clients were bigender (aka cross dressers); he did not counsel trans folk who were transmen, intersex, or genderqueer. While described as gentle and soft spoken, Jerry was mentally unstable. Besides making life decisions by lying to his wife, he also compulsively lied to doctors to convince them that medication would be healthy, even forging a divorce certificate. 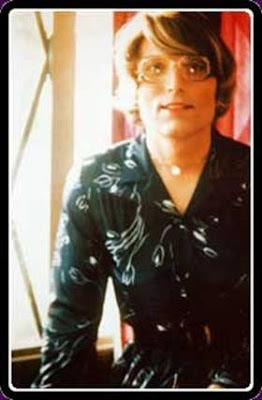 He was supposed to be going through the Real Life Test in which a person lives entirely in their gender identity to prove their eligibility for medical services; Jerry only presented as a woman in private and for his doctors whom he told he was living that way full time. In a fit of rage he castrated himself and nearly died from an infection; the castration ended his body's source of testosterone. He was happy to share this history as anecdotal proof that trans people are psychotic. He never talks about his mental stability after rejecting transgenderism, but I did speak with a member of Jerry's immediate family. They believe his mental instability continued for the past two decades. His writings reflect both irrationality and incoherence; they only make sense after several readings. Sometimes he is cool and reasonable; elsewhere he rages against detractors. He had a poor sense of boundaries, having poured out the intimacies of his sexuality online to the chagrin of his family. The decade he spent in a cult is one of the few pieces of his history off limits. He frequently lies and contradicts himself, even more than most reparative therapists. At times he claims to have a phD; elsewhere he says he does not. He tells the story of meeting "hundreds" of other trans people, including post-ops, who overwhelmingly regretted having transitioned who convinced him not to transition. Elsewhere, he says he never met a post-op until after he decided to live as a man! At times he says "transsexuals are really only a bunch of homophobic-homosexuals;" elsewhere he says most are heterosexual. He frequently cites studies which directly oppose his beliefs. At times he says "I can't really attest to a complete healing." elsewhere he offers "not abstinence and maintenance, but total freedom. . . . the Truth sets you entirely free!" Allegedly, he frequented gay bars but no one has pulled a John Paulk on him. Universally, people who've been in his program, I've observed, are very screwed up mentally, very guilt-ridden over their gender identity conflicts, and if they transition, are very guilt ridden over the families and such left behind. This appears identical to the aftermath of ex-gay counselors. Charlene specialized in "ministering" to the spouses. If the trans person refused to enter counseling and reject their gender, Charlene universally recommended divorce. In one case, the Leaches helped a spouse gain custody over children with the trans person, Megan, responsible for child support. Megan's lawyer mysteriously quit the day of the trial. The Leaches encouraged Megan's spouse to out her at work which promptly got her fired. Megan became instantly homeless and was soon jailed for not paying child support. There are two conflicting motifs leading up to Reality Resources official closure. On one hand, Jerry seems to have stopped practicing over a year ago but simply did not tell the public. As of May, even Jerry's family member believed he had retired. He closed up his practice a long time ago . . . He is retired..[sic]lives a quiet life..spends most of his time volunteering with refugees..he doesn't have a practice as such, or anything. . . . He is mentally incapable of maintaining a website..talking to any organization or individual. They explained that Jerry had contracted dementia. His memory loss thus kept him from remembering his previous conversations with clients - vetoing any chance of counseling. People who ingest female hormones have significantly higher risk of acquiring dementia; this may be coincidence or another clue that Jerry was still transgender both in feelings and behavior. Jerry also operated Jerry Leach Family Counseling, basically a for-profit physical office separate from the non-profit status of Reality Resources. That office closed in April 2007. His daughter believed that when that office closed, he stopped counseling. Further, CrossOver stopped referring people to him. Jerry was formerly a member of the American Association of Christian Counselors. In March 2008, his membership expired and did not file the simple paperwork that would have renewed his membership automatically. On the other hand, the actions of Jerry and his wife Charlene lead me to believe he was continuing until very recently. Upon closing his office, Jerry made sure to transfer contact information to his home office, both legally and for his referees such as Exodus. Upon calling Exodus this past month, they believed Jerry was still counseling and referred people "with transgender issues" to him. This past January, Jerry sent out take-down notices to several websites alleging copyright violation. In April 2009, Charlene filed their Annual Report listing she and Jerry as directors (PDF). In Kentucky, filing an annual report renews your organization for the following year. The Leach's daughter told me in May that Charlene didn't know their website was still up, although the website was updated just last March. He still answered Reality Resources phone and email. This shocked his daughter who believed Reality Resources no longer had a phone number. I find it impossible to reconcile these two themes. If Jerry was mentally incapable even of holding conversations, why did Reality Resources appear to operate as normal? Why was Jerry's daughter so mis-informed? Did Reality Resources file an Annual Report for a year of no activity? Why did they effectively renew their organization knowing they would retire a few weeks later (if not already)? The discrepancy does more than demonstrate Jerry's deceptive and inconsistent character. Therapy is serious and practicing while mentally incompetent is a serious breach of ethics. Jerry was not a state licensed counselor, putting him outside any accountability. The difficulty over such a trivial matter shows just how secretive Jerry's entire world is. Whether Jerry ended now or two years ago is irrelevant but acting in stealth implies he has something to hide. Jerry refuses to talk to the public. Jerry either ignored or lied to his family member and Exodus. Like at least Sandra Steward and Autumn Sandeen before me, I have spent lots of time trying to track down anyone even associated with Jerry. Of Jerry's thousands of clients, I cannot find a single client outside the pseudonyms Jerry gives them. I wonder if Jerry is taking a queue from William Masters. Of those who would talk honestly with me, both asked me to keep their identities and damning information confidential, fearing reprisal from Jerry, Focus on the Family, and Religious Right lawyers and supporters. If Jerry wasn't finished now and their information wasn't secret, the damnation would have forced his hand. Unfortunately, Reality Resources doesn't end here. Enter Denise Shick. Denise's father transitioned into a woman which traumatized her for years. She's now dedicated her time to public speaking about people with a transgender family member, forming the Exodus member Help4Families. In good Exodus fashion, she has no education in counseling or anything gender related. She has no transgender experience - she met with her father only twice after he transitioned. If you can stomach her website, the humiliating photo of her father demonstrates her contempt for her and all things transgender. Her only gender or counseling education comes from Jerry Leach, with whom she worked closely for five years. She now distributes Jerry's informational booklets in his stead. Also in June, apparently unrelated, another Christian, trangender-conversion group ended. New Hope Outreach in Canada was founded by Danny Blackwell but his name has been purged from their material. This is eerily similar to ex-gay disappearances when a prominent person relapses or does something embarrassing. Danny also formed pseudo organization Transgender International Fellowship, an Exodus-like network of ministries dealing with transgenderism. Help4Families is the only member that stil exists. Both TGIF's, New Hope's, and Danny's personal websites were removed at the same time. Both websites are blocking search enginges and the Internet Archive from the sites, creating the illusion that they never existed. I was certainly no fan of Reality Resources. Jerry misrepresented science, deceptively pose himself as an expert, and spread blatant lies and stereotypes of all LGBT people. They also twist Christianity into a heretical dualism of the genders, idolize culture's ideas about gender, and ignore Jesus' radical disrespect for the gender status quo. A celibate Jew was queer enough, to say nothing of Jesus' bestowing masculine behavior to women and feminine behavior to men. However, despite their flaws, I believe they did some good and their disappearance leaves a vacuum for those transgender Christians who, for whatever reason, cannot or do not embrace their transgenderism. Transitioning is incredibly hard, especially in Christian communities. A trans person's decision deserves respect, whether fully transition, make some compromise, or repress their feelings altogether. If nothing else, Jerry rebuked the Church's hatred of trans people and had empathy based on experience for that last decision. If anyone like that exists now, they're too hidden. All we have now is Help4Families, which spreads the same misinformation and dissonance to families with no actual help for trans people, families, or the Church. On the other hand, perhaps this vacuum will create room for the growth of something more moderate. The transgender arena needs something like Courage UK that emphasizes reconciliation of gender/sexuality and religion and supports every decision - whether embracing one's internal gender, one's socially assigned gender, or somewhere in between. If you or anyone you know has personal experience of information with any of these people or organizations, please contact me via my website, www.transchristians.org.